Apr. 14, 2019 8:00 a.m. Hundreds attended a celebration of R.E. 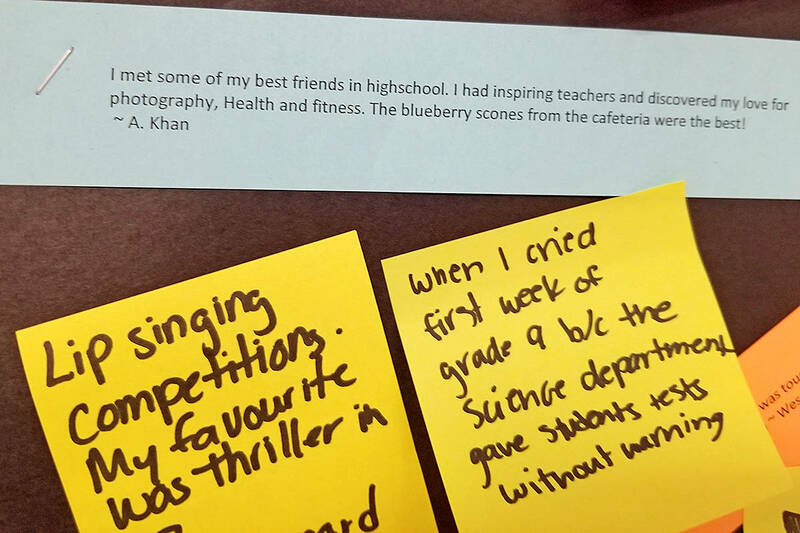 Mountain Secondary school on Saturday, sharing memories of their time in the halls of the soon-to-be-moved Langley institution at 7755 202A St.. Among them was Kwantlen First Nation Chief Marilyn Gabriel, a former R.E. Mountain student who graduated in 1982. At the Mountain celebration ceremony, Gabriel recalled being a teen mom with a baby daughter. She thought she would have to stay at home instead of going to school. Then a school counsellor phoned her. “She said, ‘bring her,’” Gabriel said. For the celebration, Gabriel brought her now grown-up daughter, Tricia, back to school one more time and they held hands as the chief talked. There was plenty of smiling and laughing as Gabriel described her child as a socially confident “tornado” who made herself at home in the hallways where her mother studied. “I couldn’t get up early enough to go to school,’ Gabriel said. 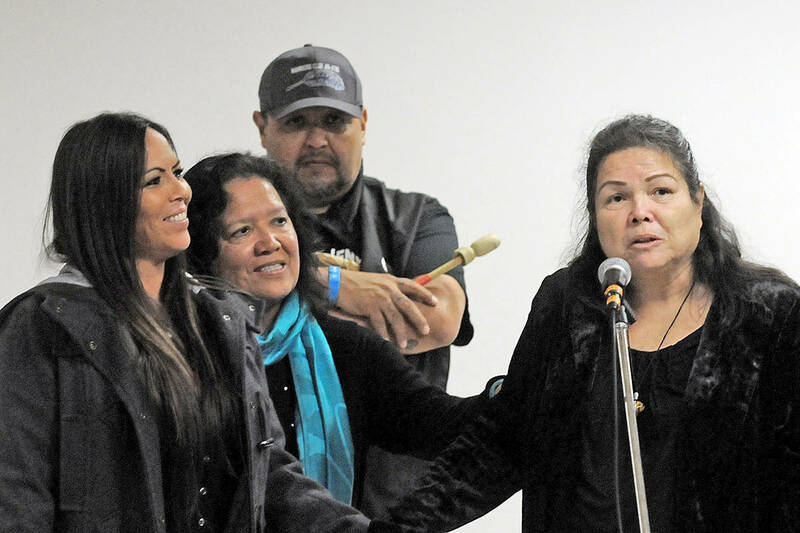 Gabriel, her daughter, and other family members and Kwantlen First Nation members sang traditional songs to the overflow crowd in a large hall of the school. Outside the hall, in the entrance foyer, a memory wall was filled with recollections of former students and staff who wrote about square dancing at Christmas, singing in the musical theatre program, taking part in a 30-hour famine event with an overnight stay at the school in 2011, and performing on the school theatre improv team. “The blueberry scones from the cafeteria were the best,” one writer noted. 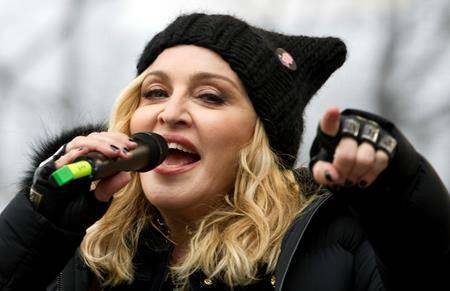 R.E. Mountain will be moving next door into new premises, but the existing building will remain as a middle school, said Supt. Gord Stewart. “It’s nice that if you decide to return [to visit], the structure will still be here,” Stewart said. 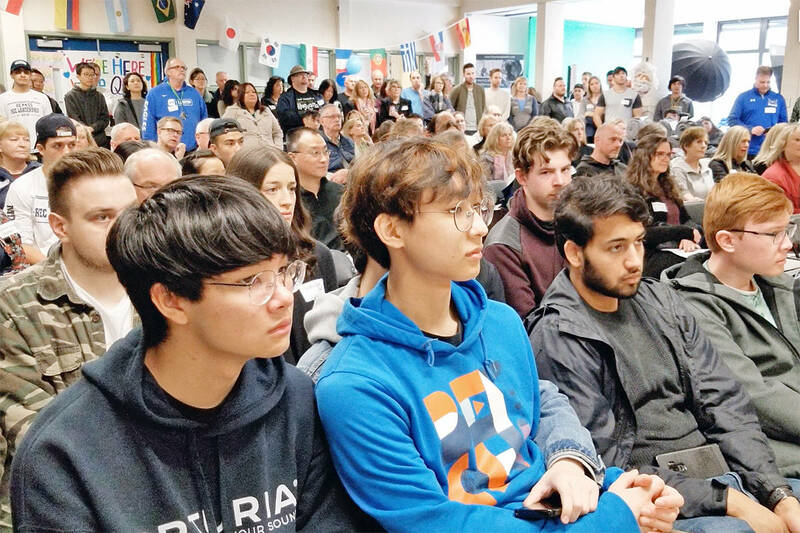 Stewart, a former vice-principal at Mountain, said there have been considerable changes in the area since the school was built in 1977, including the arrival of the Langley Events Centre and the many playing fields that now surround the school. Mike Baker, the very first principal at Mountain, said because it was a relatively small school, he chose to focus on academic expertise when he was hiring teachers. “We had to pick areas where we could do best and not replicate what the bigger schools were doing,” Baker said. “It was once said that Mountain had more teachers with masters’ degrees than any other school in the district,” Baker added. He noted the school was the first public school in B.C. to implement an international baccalaureate program. Built in 1977, R.E. 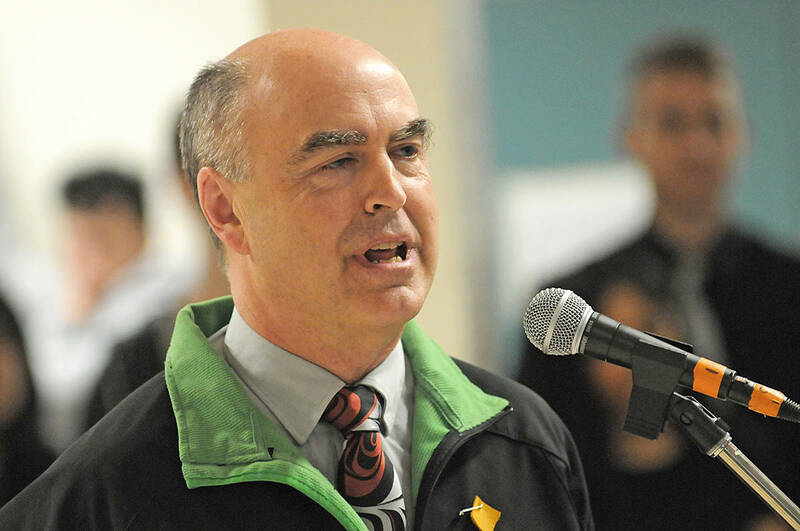 Mountain is named after Roy Edward Mountain, an educator with 40 years in Langley, a two-term Langley Teachers Association president who led a fight for better teacher salaries in 1940. Mountain had about 480 students when it officially opened. Currently, it has 1,300 students and is projected to grow by another 100 in the next school year. 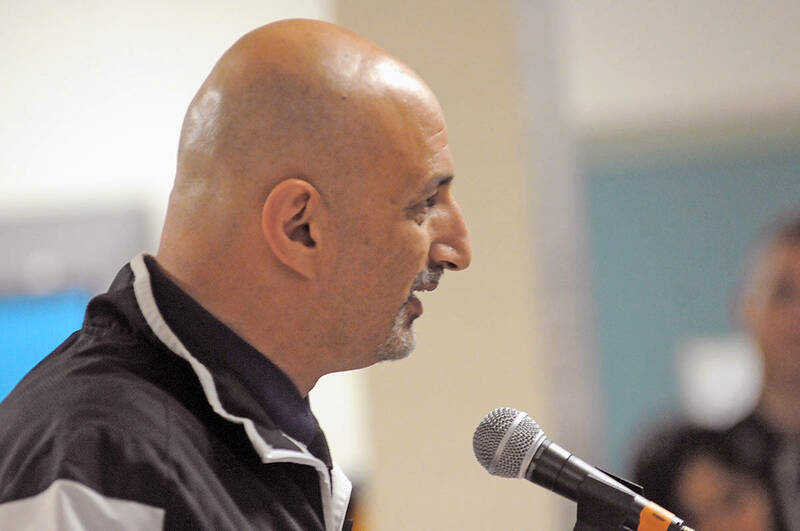 Magdy Ghobrial, the eighth and current principal, recalled starting his career as a student teacher doing a practicum in the music department in 1991. He arrived shortly after a major renovation that was known as the “Pepto-Bismol expansion” because pink was the predominate colour of the new additions, Ghobrial said. “We tried to stay away from pink in the new building,” he added. “While we look forward to moving into a brand new school in September, I am reminded that the school is not the building but the people within the building,” Ghobrial added. “We, as a school are thankful for the opportunities the current facility provided us over the past 42 years as we boomed in the 80’s, struggled a bit in the 90’s with lower enrollment, then began to grow again through today, where we are the second largest school in the district and likely on our way to being the largest,” Ghobrial said. “I do believe I am the luckiest principal in the world,” Ghobrial said, praising the students and staff. The Saturday event included tours of the school, food and entertainment, an alumni volleyball game, and a virtual tour of the new building that is nearing completion next door. After the move, the old R.E. Mountain school will become Peter Ewart Middle School, named after Langley artist Peter Ewart, who passed away in 2001.